9.30 on Sunday morning I opened our front door to be greeted by a basket of grapes sitting on our patio table. To be honest I was not surprised, happy and grateful yes, but not surprised. In the year that we have lived in this house various vegetables have magically appeared on the table. During the summer it was tomatoes and zucchini, now it is the time for baskets of grapes and pretty soon large squash will start to appear. During the week we share our good fortune with our friends because try as we might it is not possible to eat the number of eggs or vegetables that are left on the table. It is not the fairies or a leprechaun that leaves the food on the table but our neighbour Luigina. Luigina is eighty-seven years old and when she is not digging in her l’orto she is cleaning out or feeding her twelve hens. One day I asked Luigina how many eggs the hens lay, around six a day she told me, and how many eggs do you eat, around two a week. We receive between six and twelve eggs a week the other thirtyish eggs are given to her friends and relatives. A few eggs a month are stolen by her dog. 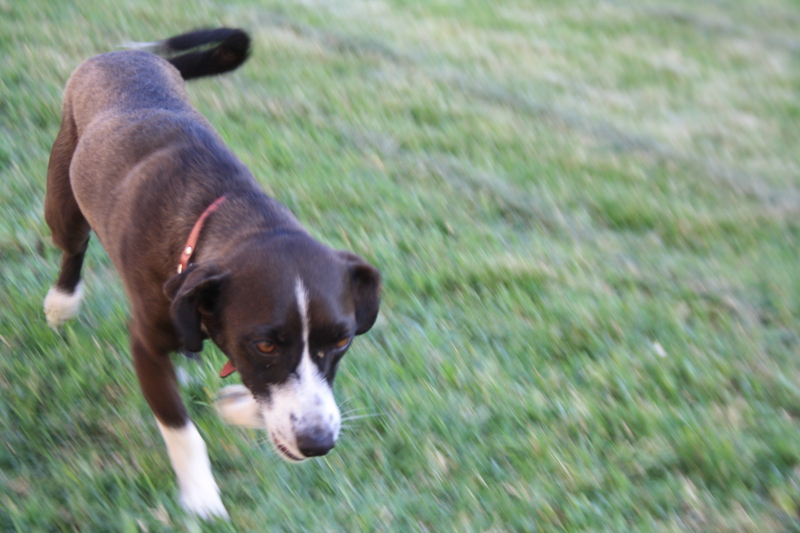 I have occasionally seen him jump the fence, pinch one egg and carefully carry it unbroken back to his kennel. So why keep twelve hens when you only eat two a week? To pass the time she tells me. At eighty seven Luigina is surprisingly fit, I have watched Luigina digging with beads of sweet running down her face, so one morning as I contemplated my own mortality and the fact that I could do with losing a few pounds I decided to start my own l’orta. 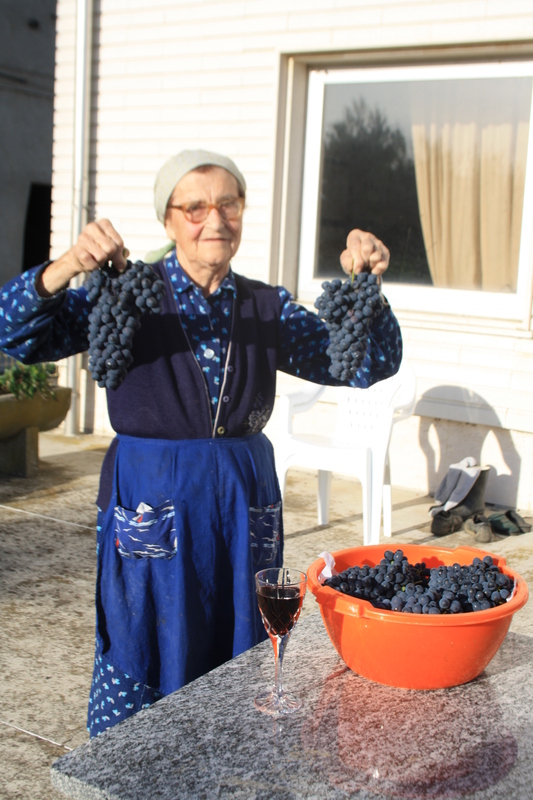 Luigina with Nebbiolo grapes, her grandson produces the fine Barolo wine. One Saturday in May under the supervision of Luigina I staked out a plot of land four meters by 12 meters for my l’orto, she advised me to use the land near a tree so there would be some shade during the summer. Looking at my plot of land Luigina was working out which plants should go where. I was working out how many calories it would take to dig the hard clay over and how much weight I would lose. She told me I would need some letame because the ground was new. As I nodded in agreement I thought I must remember to ask my wife what letame was. Sunday was beautiful and armed with my trusty spade (that had last seen action when I was working part-time for two Italian girls who had tried to create an English garden in the middle of an Italian field) I strode purposely down the garden to my l’orto. The fairies had arrived again. This time it was not a basket of grapes but my l’orto had been completely dug over. As I stood there with my working boots on and my spade in my hand Luigina arrived. I need to quickly add that my Italian is not very good and understanding Luigina is sometimes difficult because she drifts between Italian and her local dialect Piemontese, and I only understand a little Italian but the gist of the conversation was her cousin had arrived with his tractor and late on Saturday he had dug the l’orto over for me. Probably he was paid in eggs. Five months on we have had fresh vegetables ranging from crisp peas to strawberries, and one of the best parts of owning a l’orto is not eating the fresh vegetables, or watching something miraculously grow from a seed or trying to lose a bit of weight, but playing at fairies and leaving strawberries or potatoes outside Luiginas door.